AQHA Racing Champion Good Reason SA sired his first stakes winner on Saturday. WAYNE, OK�JULY 8, 2015�Champion and #2 Leading Second Crop Sire Good Reason SA sired his first stakes winner on Saturday (July 4), when the 2-year-old Woop Dee Doo won the $80,674 Heartland Futurity at Indiana Grand Racetrack & Casino. Racing for owner Ricardo Martinez, Woop Dee Doo won the 300-yard stakes by an impressive three-length margin. Prior to the stakes win, the gelding was a nose back in the $50,000 Oklahoma Futurity Invitational. Bred by John Andreini and Vince Genco, Woop Dee Doo is out of Jess Racy Eyes, a daughter of Mr Jess Perry, and a half sibling to stakes winner Fetching Beauty ($135,000) and stakes-placed runner Bolt Lightly ($32,997). Woop Dee Doo has two of four career starts while earning $59,864. Good Reason SA was a son of Favorite Trick (TB) out of the First Down Dash mare Queen Of Appeals. Bred-and-raced by Gianni Franco Samaja, the 2007 brown stallion won seven of 15 career starts while earning $1,446,727. He won the Los Alamitos Two Million Futurity (G1), Golden State Derby (G1), Champion of Champions (G1) and Los Alamitos Winter Championship (G2), and was named the AQHA Racing Champion Stallion and Champion Aged Horse in 2011. The first crop sire has sired 16 winners from 41 starters, with earnings in excess of $345,000. 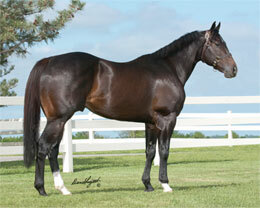 He is also the sire of Remington Park Oklahoma-Bred Futurity (RG3)-placed Send Me Good Candy ($125,444). Good Reason SA died in 2012. He stood at Royal Vista Ranches near Wayne, Oklahoma.